Any Interest in Union College Authentic Jerseys? Got my Frozen Four patch today from Classic MN Hockey (seems kind of small to me, but I have no experience with these patches). While it was a good price, I think it is worth noting that the communication and shipping speed from them was absolutely horrible. I ordered on 6/27 and got an order confirmation, but then heard nothing. I sent a polite email asking for an update on 7/7 (10 days after I ordered). I didn't get any kind of actual response from them, but they sent a shipping confirmation, and did send it out that day. It was in a plain manila envelope, with some crumpled paper that did absolutely nothing and was unnecessary. Overall, it obviously could have been much worse, but I just wonder how long it would have taken them to actually send the patch if I hadn't sent a message asking for an update. Just figured I'd post this in case anyone else hasn't got their shipping info yet on these. Send them an e-mail and apparently they'll mail it. I ordered mine June 29th, wasn't shipped til July 7th but I never sent an email. To be honest, I kind of forgot I ordered it hahah. Sent July 7th and got it today July 9th and I too thought it was kind of small but like you I also have no experience with patches. My plain manila envelope was actually open in my mailbox like the adhesiveness wore off or something but luckily the patch was still in there. Patch size is fine on them. They'll look proper when on a jersey. They aren't big honkers like SCF patches. That's kind of what I figured. Just for reference...the top pic is of a game-worn 2011 Frozen Four jersey. 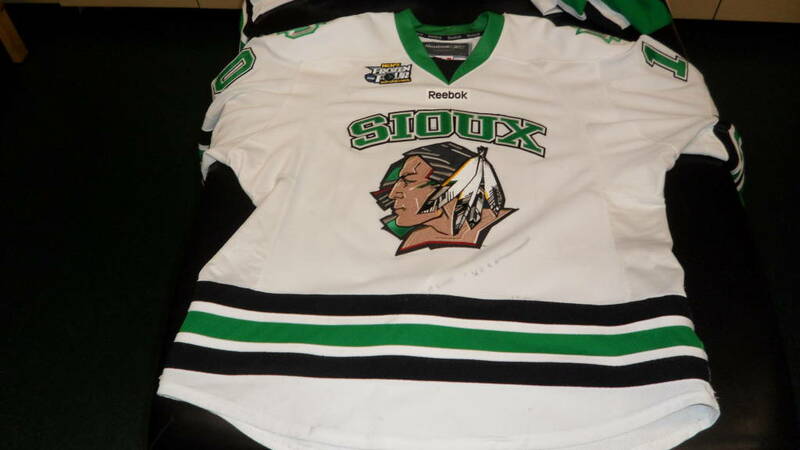 Second pic is my authentic Sioux jersey with a 2011 patch from VMH stitched on, 2014 patch laying loose next to it (also from VMH)...identical size in person. You can see the patch is a perfect fit. He supposedly gets them straight from the same source as the on-ice patches. Thanks! One day I'll post 'em all up. 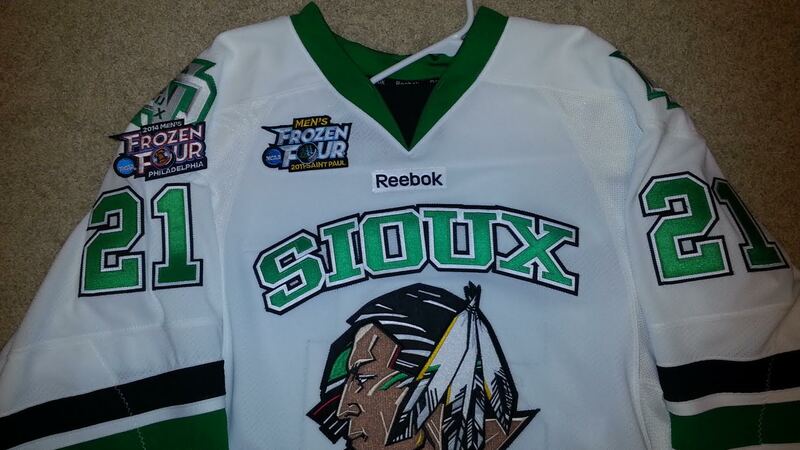 Got another half dozen Sioux jerseys on the way. Latest update says they'll be done in about a week or two. Yea. I'm definitely not impressed. It's been less than two months. If they're a week or two around the corner, you guys are way ahead of the game as far as turnaround from when the order was submitted. Whomever quoted you on turnaround time maybe didn't know what they were talking about but I assure you that two months is very quick for small orders like this. Keep in mind, Gemini is super busy at the moment doing numerous league jerseys for real teams and they are understaffed for the amount of volume that they do. It was Gemini that gave us the turnaround time quote (through our contact at Union). And them being busy with jerseys for real teams is exactly my problem. It's only going to get worse from here on out. I don't have a problem with it taking two months. I have a problem with companies not being honest about their expected turnaround time. Last year I placed an order with a company that usually had about a 3 month turnaround time....only took 'em 10 months. Their 2011 patch is actually pretty far off from the real thing. Which is weird because most of the other ones are as close as you can get. I expect another week (still within their last timeframe) to two weeks update shortly. Well that ruined my day...thanks. I wouldn't count on getting the Kings jersey back soon, lol. Well, you might get lucky but I've had a jersey there since the beginning of June that they haven't touched yet. When I stopped by there the first week of July they were very busy working on some new contract jobs that will probably take them through August, so I'm not expecting anything soon. For both our sakes, I hope I'm wrong. You might want to swing by and check in again, apparently it's my lucky day. I received an email today stating the jersey was done and will be shipped back to me.